Creating, and buying, fair trade is just about applying good common sense when we create, or buy products. It’s really about a fair deal for the people who make our goods – respectable pay, safe working conditions, and a decent benefits package – as we would strive for in a desirable job in the West. Buying fair trade is really not about ‘doing good’ or a charitable purchase – It’s about taking responsibility for our actions as a consumer, and putting our money where we know we can account for what we have supported, and we like, and even LOVE, what we know about how the products were made. nection with what you wear, what you use, on a daily basis, and completely changes your relationship with the ‘things’ you buy. I have an organic and fair trade pair of jeans, and I have to admit I smile silently every single time I put these jeans on, even after 3 years of owning them, painting in them and wearing a hole in the knee. It makes me content knowing that those jeans were a mechanism for development in a community and was a part of the stability and happiness a family or individual has created through their work. It means something that harm for the things I love around me was considered in their creation. And who doesn’t feel a little happier when they know they have tried to make a conscious choice about how we live. Yup, I love my fair trade jeans…..
Based in Kathmandu, Nepal, ACP has been established for almost 30 years – a not for profit providing design, marketing, management, and technical services to low-income Nepalese craft producers. Within ACP, artisans typically work in ‘producer groups’ which offer support, resource sharing and mentorship. Read more on ACP. 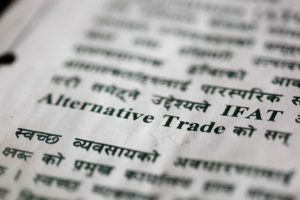 ACP is a founding member of Fair Trade Group Nepal. KTS is a non profit that was formed many years ago to focus on vocational skill and income development for a low caste community in their city who were unpaid for their work as street cleaners and living on subsistence food hand outs. Their model is simple and brilliantly effective. One part of KTS is focused on their social development mandate in the community – which over the years has grown to support wellness and development from infancy to adulthood. A nursery and daycare which offers a safe, healthy place for kids, as well as their parents to be able to work more easily. Their own school for children aged 2-12, as well as scholarships to support those in high school requiring support for fees and uniforms. Vocational training for low income or marginalized adults as well as high risk youth in the area. They place additional emphasis on supporting women and those who are disabled in their community. The other part of KTS is their income generation arm – created through their creation and sale of fair trade products – primarily knitted goods created by the adults they have offered training, as well as incredibly intricate high end carpets, and carpentry. The wonderful thing with KTS is how symbiotic their structure is – they survive and thrive based entirely on their in-house income generation, which then fuels their community programs, many of which provide the very training and skill development needed to develop the talented artisans that knit up a storm to create the knitwear such as what we sell. The whole thing is like an ecosystem.